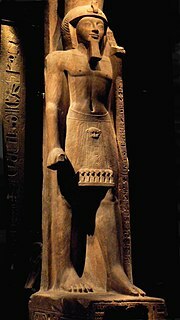 Menpehtyre Ramesses I was the founding pharaoh of ancient Egypt's 19th dynasty. The dates for his short reign are not completely known but the time-line of late 1292–1290 BC is frequently cited as well as 1295–1294 BC. While Ramesses I was the founder of the 19th dynasty, in reality his brief reign marked the transition between the reign of Horemheb who had stabilized Egypt in the late 18th dynasty and the rule of the powerful pharaohs of this dynasty, in particular his son Seti I and grandson Ramesses II, who would bring Egypt up to new heights of imperial power. 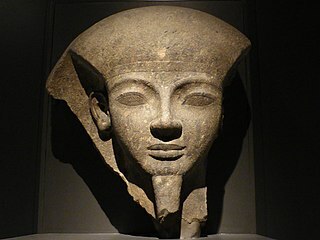 Thutmose I was the third pharaoh of the 18th dynasty of Egypt. He received the throne after the death of the previous king, Amenhotep I. During his reign, he campaigned deep into the Levant and Nubia, pushing the borders of Egypt farther than ever before. He also built many temples in Egypt, and a tomb for himself in the Valley of the Kings; he is the first king confirmed to have done this. Userkhaure-setepenre Setnakhte was the first pharaoh (1189 BC–1186 BC) of the Twentieth Dynasty of the New Kingdom of Egypt and the father of Ramesses III. Seti II was the fifth pharaoh of the Nineteenth Dynasty of Egypt and reigned from c. 1200 BC to 1194 BC. His throne name, Userkheperure Setepenre, means "Powerful are the manifestations of Re, the chosen one of Re." He was the son of Merneptah and Isetnofret II and sat on the throne during a period known for dynastic intrigue and short reigns, and his rule was no different. Seti II had to deal with many serious plots, most significantly the accession of a rival king named Amenmesse, possibly a half brother, who seized control over Thebes and Nubia in Upper Egypt during his second to fourth regnal years. Khepermaatre Ramesses X was the ninth pharaoh of the 20th dynasty of Ancient Egypt. His birth name was Amonhirkhepeshef. His prenomen or throne name, Khepermaatre, means "The Justice of Re Abides." Menmaatre Ramesses XI reigned from 1107 BC to 1078 BC or 1077 BC and was the tenth and final pharaoh of the Twentieth dynasty of Egypt and as such, was the last king of the New Kingdom period. He ruled Egypt for at least 29 years although some Egyptologists think he could have ruled for as long as 30. The latter figure would be up to 2 years beyond this king's highest known date of Year 10 of the Whm Mswt era or Year 28 of his reign. One scholar, Ad Thijs, has suggested that Ramesses XI could even have reigned as long as 33 years. 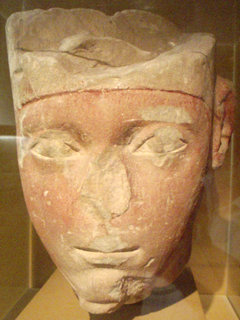 Usermaatre Sekheperenre Ramesses V was the fourth pharaoh of the Twentieth dynasty of Egypt and was the son of Ramesses IV and Queen Duatentopet. Ramesses VI Nebmaatre-Meryamun was the fifth pharaoh of the Twentieth Dynasty of Egypt. He reigned for about eight years in the mid-to-late 12th century BC and was a son of Ramesses III and queen Iset Ta-Hemdjert. As a prince, he was known as Ramesses Amunherkhepeshef and held the titles of royal scribe and cavalry general. 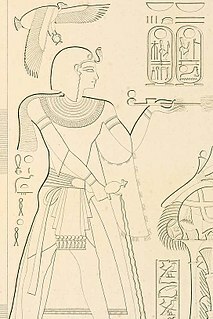 He was succeeded by his son, Ramesses VII Itamun, whom he had fathered with queen Nubkhesbed. Usermaatre Setepenre Meryamun Ramesses VII was the sixth pharaoh of the 20th dynasty of Ancient Egypt. He reigned from about 1136 to 1129 BC and was the son of Ramesses VI. Other dates for his reign are 1138-1131 BC. The Turin Accounting Papyrus 1907+1908 is dated to Year 7 III Shemu day 26 of his reign and has been reconstructed to show that 11 full years passed from Year 5 of Ramesses VI to Year 7 of his reign. 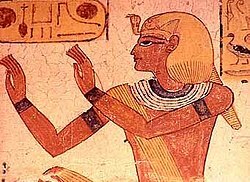 Amenmesse was the fifth pharaoh of the Nineteenth Dynasty in Ancient Egypt, possibly the son of Merneptah and Queen Takhat. Others consider him to be one of the innumerable sons of Ramesses II. Very little is known about this king, who ruled Egypt for only three to four years. Various Egyptologists date his reign between 1202 BC–1199 BC or 1203 BC–1200 BC with others giving an accession date of 1200 BC. Amenmesse means "born of or fashioned by Amun" in Egyptian. Additionally, his nomen can be found with the epithet Heqa-waset, which means "Ruler of Thebes". His royal name was Menmire Setepenre.